Hawaii'a Big Island is known for its unique and beautiful beaches, which range from popular family day resorts near Hilo to unique remote sites showcasing new black lava formations and world-renowned olivine, or "green," sands. 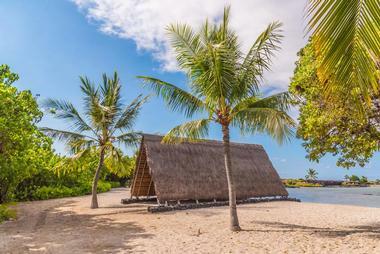 A number of beachfront sites contain significant archaeological landmarks, such as Holoholokai Beach Park and Kamakahonu Beach. Hapuna Beach State Recreation Area is often voted as one of the world's best public beaches, spanning 61.8 acres near the city of Kawaihae. The beach is one of the Big Island's most popular white sand beaches, stretching half a mile along its western coastline and offering opportunities for swimming, surfing, and snorkeling. Hikers can pick up the Ala Kahakai National Historic Trail within the park, which traverses ancient trails within the island and travels past several anchialine ponds. The park's Tree Frogs Cafe offers delicious lunch fare, along with snorkeling gear, boogie board, and beach equipment rentals. Camping permits are also available for visitors, with lifeguards staffed on duty year-round at the facility. Ai'opio Beach is a quaint, shady beach within Hawai'i's Kaloko-Honokohau National Historic Park, which is home to important archaeological sites showcasing the lives and cultures of pre-European indigenous Hawai'ians. The beach is located at the site of the ancient Ai'opio Fish Trap, which was designed to trap fish at low tide and can be viewed by beach visitors. 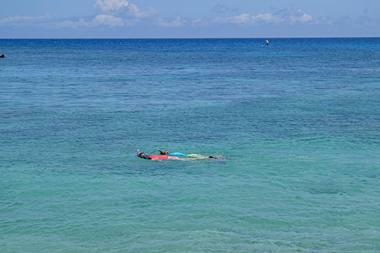 Calm waters make for perfect family swimming conditions, with shallow tide pools available for youngsters to wade in. Beachgoers can also observe sea turtles in their native habitats as they graze on seaweed, though all visitors should be advised to avoid direct contact with the animals as they are a protected endangered species. 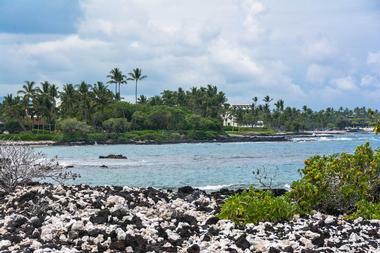 The beach is accessible via Highway 19 from Kona, with public parking offered at Honokohau Harbor. 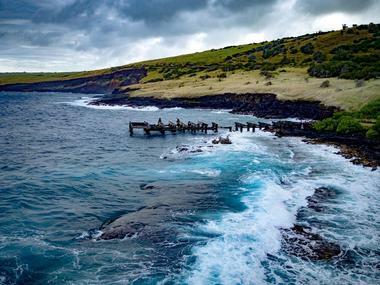 Carlsmith Beach Park, also referred to as James Kealoha Beach Park or Four Miles, is one of the Big Island's best family beach destinations, with a swimming pool-type atmosphere and water conditions due to a surrounding coastal reef and lava formations. 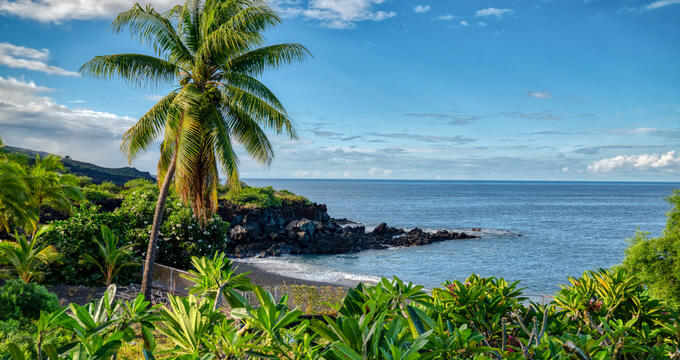 The cool, calm water beach is a prime spot for snorkeling near Hilo, offering opportunities to interact with sea turtles in their native habitats. 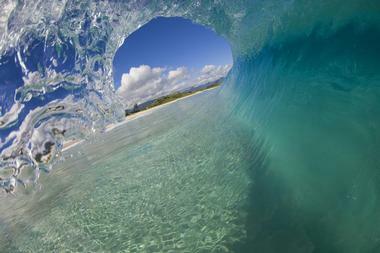 Areas are also offered for surfing and for pole and spear fishing. Lifeguards are staffed at the beach on weekends and holidays, with public amenities available, including showers, restrooms, and day-use picnic areas. Despite the lack of a sandy beach shore, the beach offers ample area for sunbathing along a beautiful well-manicured lawn area. 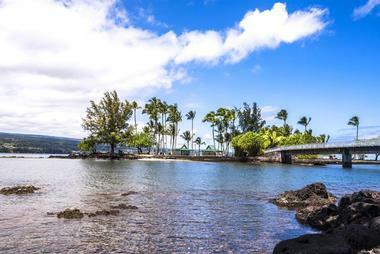 Visitors can access the beach via Highway 137, just a 10-minute drive from Hilo's downtown district. 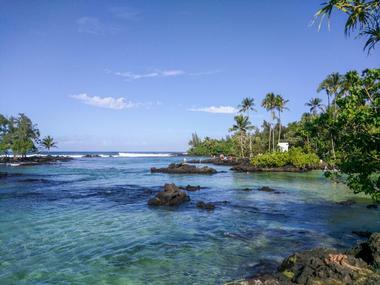 Coconut Island is a popular beach island within Hilo Bay, not to be confused with the island of the same name in Kane’ohe Bay that is used as a marine research facility. The island is located off the shoreline of Hil's Lili'uokalani Park and Gardens and is also known as Mokuola, an indigenous Hawai'ian name roughly translating as "healing island" for legends that the water surrounding the island could cure ailments and redeem warriors. Today, the island is a lively family recreation destination, best known for its 20-foot jumping tower, which offers two levels for ocean jumping. Visitors can also relax on its large grassy lawn or pack picnics for enjoyment at several public pavilion areas. The island is also a prime spot for photography of downtown Hilo and the nearby Mauna Loa and Mauna Kea volcanoes. Holoholokai Beach Park gives visitors a glimpse of Hawai'i's ancient art and culture, showcasing the impressive Puako Petroglyphs, the state's largest-known collection of ancient drawings and etchings. Visitors can take the Malama Petroglyph Trail to the site, which is home to more than 3,000 works of art on immense boulders. Back on the beach, black lava rocks and white coral rubble make for a beautiful contrasting shoreline, though the ocean shoreline's high surf and rocky bottom prevents safe swimming conditions. Day-use picnic sites offer tables and barbecue grills, while grassy lawns provide opportunities for sports and other play. Public restrooms and showers are also offered for visitor use. Honoka'ope Beach, also known as 49 Black Sand Beach, is a secluded beach within Hawai'i's Mauna Lani Resort area, located along a shoreline populated by luxury and resort homes. The quaint salt-and-pepper-colored beach is open to the public between the hours of 8:00am and 5:00pm and offers prime opportunities for snorkeling during calm water conditions. Nearby spectacular lava cliffs make for dramatic backdrop scenery and are accessible from a trailhead embarking at the beach. Visitors should note that beach access is restricted to a limited number of visitors each day, with beach access passes available at the resort's entrance gate. Only 20 parking spaces are available at the beach, so visitors are advised to arrive early in the day to secure access. Honoli'i Beach Park is a popular surfing beach on the Big Island's eastern coast, approximately 2.2 miles north of the city of Hilo. As one of Hawai'i's only year-round surfing beaches, the beach is staffed by county lifeguards and showcases unique surfing conditions during each season. Summer waves make for ideal conditions for novice surfers, while high winter surf conditions make for excellent challenges for experts. The park's black sand, beach glass, and coral rubble beachfront is also a popular spot for fishing, though its conditions are not ideal for swimming in most areas. Several spectator areas allow visitors to watch surfers, while day-use picnic areas offer privacy underneath a grove of native trees. Kaimu Beach was one of the Big Island's most famous black sand beaches prior to volcanic eruptions from the nearby Kilauea volcano in 1990, which covered the nearby towns of Kaimu and Kalapana and coated the beach in new lava flows. Today, the young black sand beach within the Puna district is in the process of new formation, standing 50 feet higher than the former beach area. Though conditions do not allow for swimming, sunbathing, or watersports, visitors interested in volcanology can explore the beach's Kaimu Beach Eco-Path, which showcases barren lava fields created by the eruptions. Visitors should take care to watch for sharp lava rocks at spots where shoreline access is offered. Nearby, Uncle Robert's 'Awa Club offers local food vendors and a weekly farmer's market. Kamakahonu Beach was the former residence of King Kamehameha the Great, the first ruler of the Kingdom of Hawai'i, who reigned over the islands between 1782 and 1819. Kamehameha's final home was located at the beach, where he lived between 1812 and 1819. Today, visitors can see the remains of his personal Ahuena Heiau temple and other office and religious buildings still standing at the site. 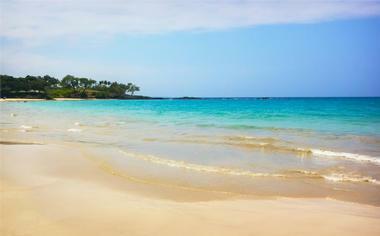 As one of the big island's safest swimming beaches, residents have nicknamed the beach "the Children's Beach." Swimming, snorkeling, fishing, and boating are popular beachfront activities, with boat and snorkeling gear rentals offered. Visitors can also make use of its day-use beach facilities, including picnic sites with barbecue grills. 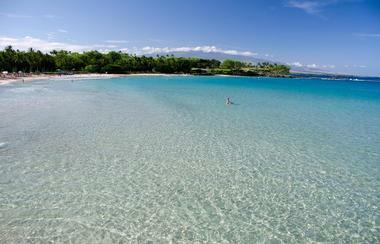 Kauna’oa Beach, also referred to as Mauna Kea Beach, is one of the Big Island's most beautiful white sand beaches, located at the Mauna Kea Beach Hotel. The family-friendly half-mile beach is a prime spot for swimming, sunbathing, and snorkeling during warm months, though visitors should note that strong rip currents and high waves can make ocean entrance dangerous during winter months. Though beach access requires entrance through the Mauna Kea Beach Hotel, day-use visitors can receive free beach passes from the hotel's security office. Visitors can dine at the hotel's restaurant while using the beach, which offers lunch and dinner service and tropical alcoholic beverages. During the evening hours, floodlights at the hotel attract manta rays, making for great evening wildlife watching conditions. 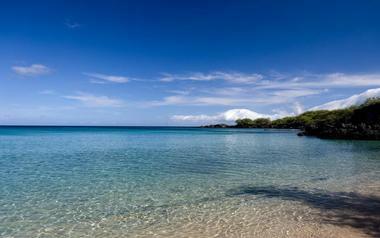 Kehena Beach is one of the Big Island's few clothing-optional beaches, located within the island's Puna district. The beach was originally formed in 1955 from uphill lava flows and dropped nearly three feet toward sea level following a strong earthquake in 1979, causing its concrete beach stairs to break off. Today, the beach is commonly known as Dolphin Beach because of its populations of spinner dolphins, which can be observed throughout the year. The long, narrow black sand beach is also a popular spot for swimming during calm water conditions, though visitors should note that sudden strong undertows and rip currents can cause near-drowning incidents. 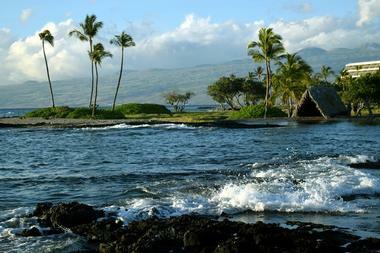 Kiholo Bay is one of the Big Island's most iconic beaches, located within the island's North Kona District and flanked by lava flows created by Mauna Loa and Mount Hualalai in the 19th century. Much of the bay's current area was formerly used as a fishpond constructed by King Kamehameha in 1820, though public structures were destroyed as a result of lava flows in 1859. Today, the beach is a popular spot for snorkeling and swimming due to its calm waters, with a miniature lava rock island visible from its shores. Nearby at the private Wainanali'i Pond, visitors can observe green sea turtles from a distance in their natural habitat. 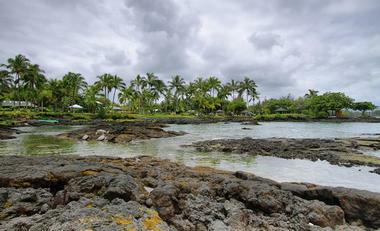 Kolekole Beach Park is a local beach located approximately 10 miles north of the city of Hilo, serving as a popular picnic site for residential visitors. Though the beach's ocean water conditions are not conducive for swimming, its Kolekole Stream, which is fed by the beautiful Akaka Falls, serves as a popular swimming site. A bridge constructed by the Hawaii Consolidated Railroad in the 19th century was destabilized for use in 1946 due to a tsunami and is now visible more than 100 feet above the beach. Spacious grassy lawns provide ample space for picnics and visitor recreation throughout the year. Visitors can access the beach from Hawaii Belt Road, with public parking areas offered. Makaiwa Bay is a lovely sandy cove that is accessible from Highway 19, located near the Mauna Lani Terrace condominium complex and the Mauna Lani Bay Hotel. The quaint beach is a popular spot for swimming and snorkeling during calm water conditions, with ample opportunity offered to watch for native fish within ocean waters. A public parking lot is provided approximately 10 to 15 minutes on foot from the beach along a paved scenic trail through lava fields, offering an opportunity to pass the ancient Kalahuipua'a Mauna Lani fishtraps. Once visitors arrive at the beach, they are greeted by pristine white sands and palm trees, with a boat ramp offered at the bay's northern end. Makalawena Beach is one of the Big Island's most gorgeous natural beaches, accessible on foot from a hiking path from nearby Kekaha Kai State Park near Highway 19's 90-91 mile markers. 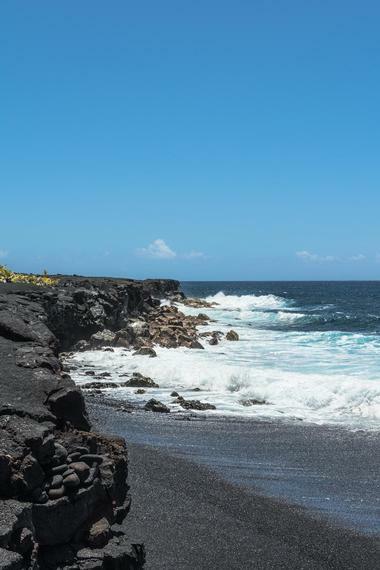 Visitors can walk approximately 20 minutes across a hot and barren lava field to the beach, which offers beautiful scenery along the way, or access the beach from a secluded 1.5-mile walk accessible at Highway 19's 88-89 mile markers. Once at the beach, powdered white sand beaches and spectacular coastline views await visitors, with prime conditions offered for swimming and boogie boarding. Tide pools and coves abound, with ample shaded space for relaxation and picnics. During the autumn and winter months, visitors can view humpback whales from the beach's shoreline. 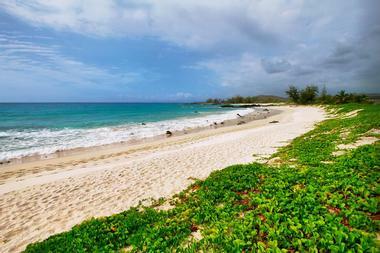 Manini’owali Beach is a secluded beach located along Kua Bay, often considered to be one of the Big Island's most beautiful white sand beaches. 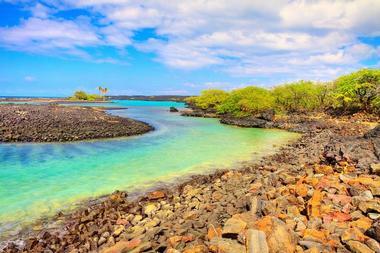 Access to the beach is moderately difficult compared to other area beaches due to a 10-foot cliff of lava rocks that must be climbed down in order to reach the beachfront, but once on the beach, the reward is worth it, as crystal-clear waters, soft white sands, and prime snorkeling conditions await. 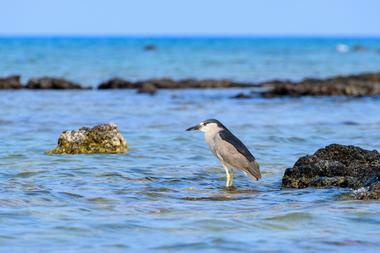 Wildlife sightings are common at the bay, with populations of sea turtles and dolphins located nearby. Visitor facilities at the beach include public restrooms and showers. As the beach is a very popular tourist destination, visitors are advised to visit on weekdays to avoid large crowds. 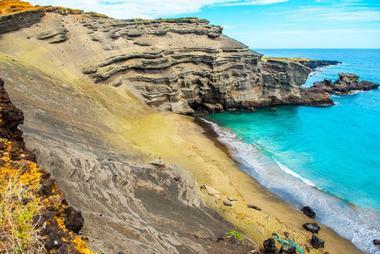 Papakolea Beach is one of only four unique green sand beaches in the world, along with Guam's Talofofo Beach, the Galapagos Islands' Punta Cormorant, and Norway's Hornindalsvatnet. The beach's stunning green-hued sands are created from olivine crystals washed ashore from a 49,000-year-old cinder cone of the Mauna Loa volcano and is considered to be a once-in-a-lifetime tourist destination for many Big Island visitors. As driving to the beach is illegal due to the fragile environmental conditions that create its green sands, it is only accessible via a 2.5-mile hike from a parking area at Highway 11's 69-70 mile markers. No public facilities are offered at the beach, so visitors are advised to bring food and water. 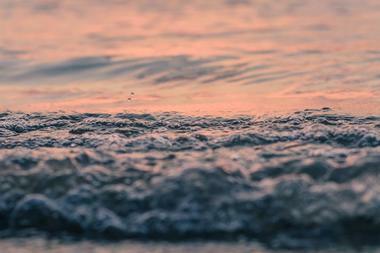 A strict leave-no-trace policy is enforced to ensure the beach's future preservation. Punalu’u Beach is the Big Island's most well-known black sand beach, located at Highway 11's 56-57 mile markers between Volcano Village and Naalehu. The beach is a prime spot on the island for viewing endangered Hawskill sea turtles, though visitors should note that direct contact with turtles is illegal due to sensitive habitat concerns. Beautiful pitch-black lava sands line the beach, created from both old and new lava flows. Opportunities for swimming are available in calm water conditions, giving visitors a chance to experience the beach's unique dual-temperature waters created by underwater freshwater springs. 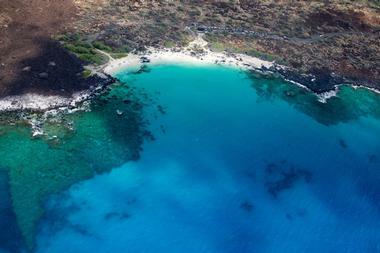 Snorkeling is permitted at Ninole Cove, and overnight camping is allowed with permits. Though parking and restroom facilities are offered, visitors should note that lifeguards are not staffed at the beach. 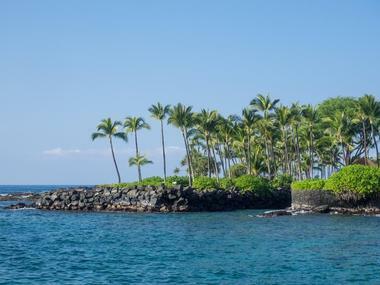 Richardson Ocean Park is the best spot for snorkeling on the Big Island's eastern coast, located along a stretch of beachfront near Hilo that is also home to Carlsmith, Lele'iwi, and Onekahakaha Beach Parks. The beach is home to a significant marine conservation area and is open to the public daily between 7:00am and 7:00pm, with lifeguards staffed year-round. Visitors can explore the beach's beautiful mixed-color sands, which are created from a mix of black lava deposits and unique olivine crystal green sand. The beach is a favorite family destination on the weekends, offering calm water conditions for swimming and tide pools for wading. Day-use picnic areas are available for visitor use, along with public restrooms, showers, and telephones. Samuel M. Spencer Beach Park is one of the Big Island's loveliest white sand beaches, named in honor of a former Hawai'i County Board of Supervisors who was influential in the development of the North Kohala Coast. The beach is known for its prime conditions for swimming and snorkeling, making it a popular spot for families on the weekends. Ample shade from native tree cover creates cozy spots for picnicking, with pavilions available offering electrical outlets. Visitors can acquire permits for overnight camping at the site or hike to the nearby Pu'ukohola Heiau, an historic temple constructed by King Kamehameha. Children's playgrounds are also available for day use. Waialea Beach, also known as 69 Beach for its proximity to a local numbered utility pole, is a white sand beach located within a residential area on the Big Island, accessible from Kona along Highway 19 and Old Puako Road. Though no lifeguards are staffed on duty, the beach is a very popular spot for swimming, snorkeling, and scuba diving during the summer months, offering a perfect mix of sun and shade conditions for visitor relaxation and recreation. A wide variety of marine life resides within the beach's waters, which were designated as a marine conservation district in 1985. During the winter months, visitors can even spot humpback whales from the beach's shores. The moderate-difficulty Ala Kahakai Trail embarks from the beach, looping 15.4 miles along the island's coastline and offering opportunities to see ancient Hawai'ian sites and anchialine ponds. Wawaloli Beach Park is one of Kona's most family-friendly beaches, operated by the Hawai'i Ocean Science and Technology Park and the Natural Energy Laboratory of Hawai'i. It is best known for its sand-filled tide pools, which offer ample opportunity for young visitors to wade in safe shallow water conditions. Tide pools are protect from the ocean's surf via natural lava barriers, ensuring pristinely calm and warm water conditions. Day-use picnic tables with barbecue grills are offered, along with visitor amenities such as showers and public restrooms. 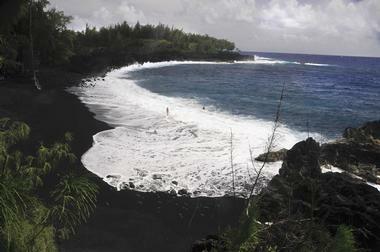 Visitors can access the beach vis Highway 19 near the Kona Airport at mile marker 94.